Call Mack Hauling for all your junk removal needs. Serving the Crystal City and Pentagon City areas. 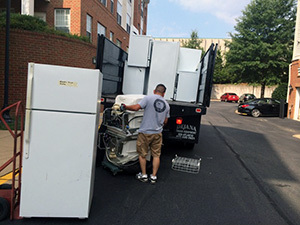 Schedule your pick up by calling us or complete our FREE ESTIMATE request. We will get back to you promptly. Ready to serve residents and businesses in the Pentagon City and Crystal City near Reagan National Airport area including stores, and hotels such as Aurora Highlands, Virginia Highlands Park area, Crystal Towers, Crystal City Marriott, Lenox Club Apartments, Residence Inn Arlington Pentagon City, EA Museum and Visitor Center, Pentagon Row, Fashion Centre, Embassy Suites, Hilton Crystal City, Americana, The Oakwood Metropolitan, Crystal Towers, The Westin Crystal City, Crystal Plaza Apartments, Hampton Inn & Suites, Radisson, Crystal House, The Westin Crystal City, Crown Plaza, Water Park Towers Apartments, North Tract Lofts, Boeing, Arlington House, Ritz Carlton, Fashion Centre, Pen Place, and all surrounding residential areas and businesses. We travel regularly down roads including Interstate 395, Henry G. Shirley Memorial Highway, Route I66, Route 1, Jefferson Davis Hwy, Boundary Channel Drive23rd Street, Army Navy Drive, S. Arlington Ridge Road, 15th St. S. Fern St., South Hayes Street, S. Joyce Street, S. Washington Blvd., S. Eads St. Long Bridge Drive, Military Road, Chesterbrook Rd, N. Pershing Drive, Kirkwood Rd., Old Dominion Drive, Williamsburg Blvd., and all surrounding areas in the 22202 Pentagon City and Crystal City zip code.